Taking advantage of a hot new trend in cities big and small, this book includes information on scooter history, culture, and celebrities plus “how to buy” tips and info. The Scooter Book is a wonderfully fun, retro-hip book that aims to take advantage of a hot new trend in cities big and small; this book includes information on scooter history, culture, and celebrities, plus “how to buy” tips and info. It includes more than 150 colorful photos of scooters, including all the top-selling models, plus period-evocative historical memorabilia from the 1950s and 1960s. 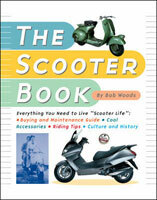 The Scooter Book connects the hipster nostalgia of the scooter to today’s modern life. Lifelong rider and writer, the author, Bob Woods, takes readers on a zippy ride through scooter history, stopping off to see how World War II, Audrey Hepburn, and the Who have all played a part in this re-occurring transportation trend. He also tells how to maintain, repair, and care for a scooter and scooter-related gear. Bob Woods is a writer living in Madison, Connecticut. Bob was the editor of the Harley-Davidson 100th Anniversary Magazine and has written hundreds of articles for major magazines (including Sports Illustrated and Money Magazine) on sports, business, and culture.